Detail of completed fitted kitchen for Fleetwood customerAt J C Joinery, we take pride in our quality professional service. Take a look below at a few of our past references from satisfied customers. 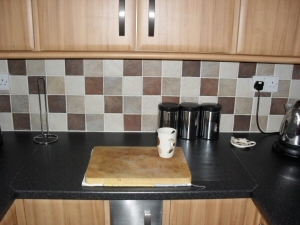 I know we spoke and I had the opportunity to say thank you for the superb job you have made of fitting my kitchen. However I thought I should commit to words just how pleased I am. I could not be happier with the finished product. The way in which you co ordinated it made everything run like clockwork. I also have to say that all the trades that came and went throughout the project were professional and very respectful a pleasure to have around. I would happily recommend you to anyone and you deserve a prosperous business. I look forward to you doing work for me in the future. As you know the kettle is always on so you are welcome for a brew at any time. As a company, we have recently used the services of J C Joinery on a development we manage called Admirals Sound situated at Kingsway, Cleveleys promenade. The development is made up of 53 apartments and is a four storey block. J C Joinery have installed new soffits, facias, guttering and downspouts to the building. The directors and myself are very pleased with the works carried out by this company and would recommend them to other companies and will also be using their services again. I have had work carried out by J C Joinery on numerous occasions, most recently for the construction of a large garden pergola over a decked area. I am always impressed with the quality of the work carried out, along with the attention to detail and I would highly recommend their services.